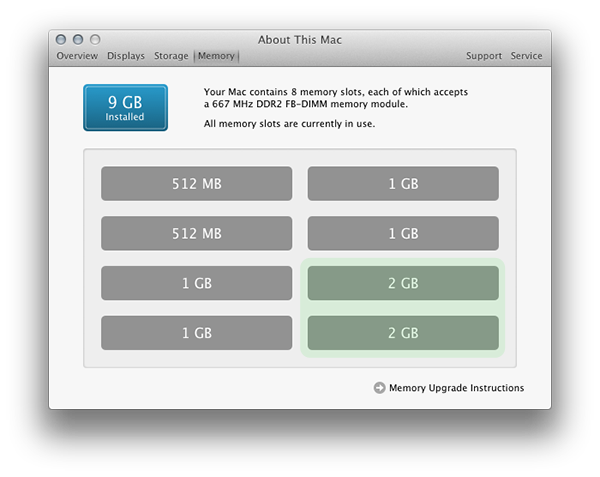 Recently I’ve upgraded my iMac’s memory, and now I’ve upgraded my Mac Pro’s memory. Extending it to 9 GB, yay. Maybe it’s because I am (self acclaimed) geek / nerd, but I still get excited when I can tinker with my hardware, tweaking it, upgrading it so I can use it better, and hopefully a bit longer. As an operating system and the software for it grows up it requires more of the system. Giving it a bit more breathing space, especially with the newer 64 bit OS we use now, certainly does help. The Mac Pro is a server basically, and mine’s from 2006 and should be written off and replaced with a new one. But, I simply do not have the money. And that means I have to put some cash aside for tiny upgrades, new hard drives, new memory, new track pad, stuff like that. As much as I would love to have a Mac Pro with thunderbolt, usb3, and a few cpu’s giving me about 12 cores. It’s certainly overkill, not worth the money, and I simply don’t need or, nor can I afford it (it’s not even out yet anyway). Saving up for a year and spending a hundred bucks on a good hard drive, or some quality memory, … worth it. At least, in my personal and humble opinion. Normally I would go to macsales.net (see imac upgrade post for details), but it’s around a hundred bucks, and I simply don’t want to spend another 20 or 50 just for customs. I went to a local on-line store called Azerty.nl where I have placed orders for hardware for me and my family before. They still had the Kingston memory kit (4GB total) in stock. 2x 2GB, FB-DIMM 240-pin, DDR2 667 MHz, PC2-5300 CL5, 1.8V, buffered ECC, 4 GB Kingston kit. Offtopic: Azerty.nl password reset gives you a password in plain text, I immediately contacted them requesting them to realize this mistake and invited them to consider going with a unique hash plus unique salt storing setup. Their response per e-mail was that they encrypt (with a salt) (lolz?) and that they’ve chosen to go with a balanced ‘customer convenience vs security’ setup. And they also mentioned they have no access to the password, and that it’s only mailed in plain text when it’s generated. How all of that is utter nonsense is unclear to them. What, they don’t have the encryption key or the salt method? Why I care? Because I provide them with my personal data, my personal password (unique to their site thankfully) and payment details. And I don’t want malicious people to abuse my data in the future because of their ignorance towards what really is a convenience for customers (by preventing abuse in case of a system compromise or malware that scans emails). My old setup was 4x 512mb, 4x 1gb, as the Mac Pro basically has two raiser cards connecting to the motherboard. Making it very easy to pull them out, put new ram in, and push them back in. And it offers 8 banks to fill. My early 2006 Mac Pro can therefor do 16 or even 32 GB of memory, newer models can do 32, and some 64 or even 96. I don’t know the specifics, check out everymac.com for those details. The system came with a standard 2x 512mb, and I have upgraded it over time by just adding more 2x paired to the banks. This time however I had to remove the standard 2x 512mb, as all my 8 banks were filled. And add the 2x 2gb. Making me go from 6 gb down to 5 gb, and then +4 new making it 9 gb total. The goal was to have 8gb, just like the iMac. Excellent! The Mac Pro server does a bunch of stuff, I let it handle MySQL databases, back ups, streaming music, running MineCraft servers, web servers, and a local wiki (as a knowledge base). I remote connect to it via screensharing, and it basically doesn’t have a keyboard, mouse, or anything else connected to it. I shut it down, removed the side panel, pulled out the riser cards, cleaned them up a little bit, removed the memory after identifying them, putting the new memory in and reverting the process. Boot up the system, and done. It really was disappointingly easy. It’s awesome how computer cases (for windows, mac or enterprise stuff) have evolved over the years. Swap is no longer in use by the OS, well, it’s 64 megabyte. Each program, photoshop, the server services from OSX Lion Server, or the MineCraft servers, they all have at least a gig, and a gig free to use. And I took the opportunity of this downtime to spread the load over the four internal hard drives. OS of course on one, MySQL now using the second drive, the private MineCraft servers on the third, and the public MineCraft servers on the fourth. This also means it is a bit easier to make local backups from one drive to the other. So if a drive fails I might get lucky by having a copy of the backup on a second drive. Anyway, that’s for a different blog post probably. The Mac Pro runs as smoothly today as it did in 2006, and sure, there are a few performance compromises, but it went from 32bit Tiger to 64bit Lion (server edition) (it seems it’s not compatible with Mountain Lion, which made me cry). And I am glad it does, so investing a bit of money compared to buying a new system, .. no regrets. I am hoping to use this year to save up some money to buy an SSD drive to give the OS and MineCraft a bit of a boost. There are a few extra ESATA ports available, or just replace an existing drive.